Earlier this week, the Joint Committee on Taxation released a report outlining the feedback that these working groups received (starting on page 490). Underscoring the political challenges to tax reform, a range of conflicting suggestions was given to these different working groups. 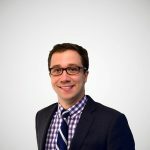 A good example of the range of policy choices surrounding tax reform are the suggestions given to the Working Group on Debt, Equity and Capital regarding the tax rate of dividends and capital gains. As you can see, some want these taxes lowered, some want them kept the same, while some want them to be increased. I want to focus on the two specific suggestions to raise taxes on capital gains and dividends. 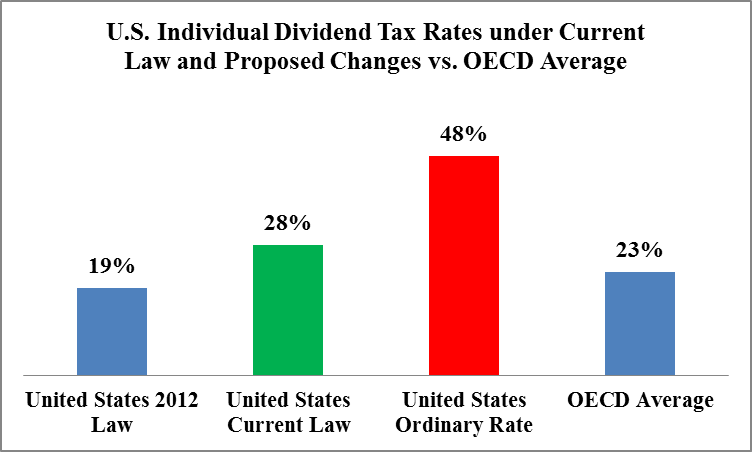 What would these changes theoretically look like compared to the OECD average tax rates on dividend and capital gains income? For capital gains, the current law is already out-of-step with international standards. 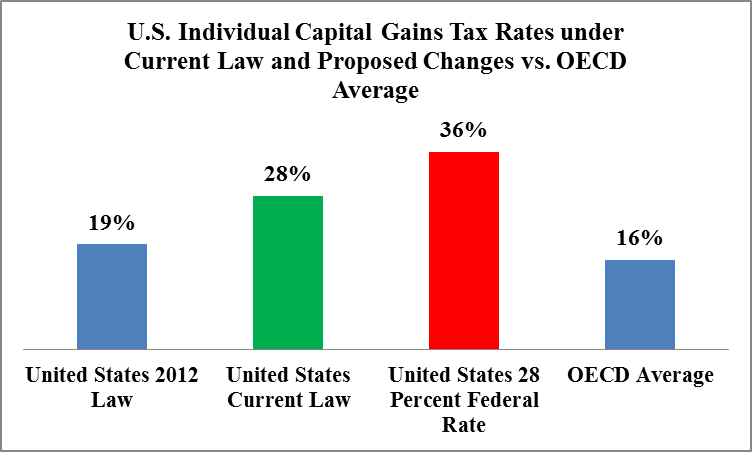 After the fiscal cliff, combined state and federal capital gains rates increased from 19.1 percent to 28 percent. This is more than 10 percentage points higher than the international average. One suggestion, of course, is to tax capital gains at the rate at the 1986 rate of 28 percent. This would push America’s average combined federal and state capital gains rate to more than 35 percent, more than double the international average. As for dividend taxation, the United States used to have a rate lower than the international average, but after the fiscal cliff deal the average rate increased to over 28 percent. Again, one of the suggestions above is to treat dividends as ordinary income. This would push the tax rate on dividends to more than twice as high as the OECD average to the top marginal combined state, local and federal income tax rate of 47.9 percent. Internationally, our capital gains and dividend tax rates are too high already. For the past 3 decades, countries throughout the world have been lowering their individual capital gains and dividends tax rates. Following these suggestions and raising these tax rates would be a bad idea and in total opposition to current international trends. These trends reflecting the realization that lowering your tax burden on saving spurs investment, increases a country’s economic competitiveness and spurs economic growth. Raising these taxes would put America further at risk for losing its competitive edge.